Mary Baker Eddy Library is the repository for the personal documents of Mary Baker Eddy, founder of the Christian Science Church. The library is also a museum and features a grand Hall of Ideas, Newsroom Gallery, Press Hall, and the famous Mapparium exhibit. The library hosts many events that are free to the public and are an invaluable community service. Mary Baker Eddy (1821-1910) was an influential author, teacher, and spiritual leader during the nineteenth century. She advocated a Christian religious belief system that led to her founding the Church of Christ, Scientist, in 1910. Christian Science asserts that human beings and the universe are spiritual in nature, and that good is a tangible thing. The existence of God denies the reality of sin, sickness, death, and a material world. Believers pray and study God to discover this truth. Members of the Church seek spiritual healing through prayer, as Jesus practices in Biblical stories. The Mapparium is a three-story walk-through globe. This glass-paneled globe was constructed in 1935, and represents the national boundaries of that time. There are 508 glass panels in total. Walking through the Mapparium is a unique experience, as one perceives a global or international view of the world, and also a historical perspective of how nations have changed since 1935. The Hall of Ideas is a venue for public talks and musical performances. A disk shaped glass sculpture by Howard Ben Tré is the centerpiece of the grand hall. Each summer there are musicals and dramas in the hall. During the holiday season, there are public festivities that celebrate Christmas and the New Year. Exhibits are family-oriented, and often feature arts & crafts and other children’s activities. Monitor Gallery hosts multi-media and interactive exhibits relating to the Christian Science Monitor, a Pulitzer Prize winning international newspaper. There is a huge window that overlooks the Monitor Newsroom, where views can actually observe an active newsroom. Press Hall relates to historical events that occurred at the time when the Christian Science Monitor newspaper was established. Quest Gallery includes photos, documents, and other artifacts relating to the medical, cultural, and religious history of mid-19th-century America. 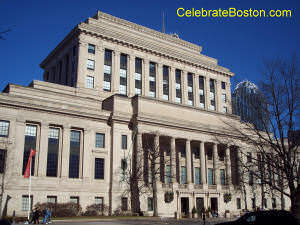 The Mary Baker Eddy Library for the Betterment of Humanity is located in the Publishing Society Building that is part of the 14-acre Christian Science Plaza complex. The First Church of Christ, Scientist, is the the plaza's beautiful centerpiece.